First he studied law at the St. Petersburg University, then privately singing with Ioakim Tartakov. He made his debut in 1910 in a concert together with the famous Heifetz. In 1910, Rosing departed to Europe where he perfected singing with Sir George Power (London), Giovanni Sbrillia and Jean de Reszke (Paris). He made his operatic debut at the Theater of Musical Drama in St. Petersburg as Trike in ‘’Eugene Onegin’’ (1912). Later he appeared there as Lensky (‘’Eugene Onegin’’), Pretender (‘’Boris Godunov’’) and Walther von Stolzing (‘’Die Meistersinger von Nürnberg’’). Here his partners were L. Lipkovskaya and M. Davidova. He became world famous after his sensational debut in London at Albert-hall (together with Alice Verlet and Mischa Elman, 1913). In 1914 he became a director of the London Opera House ‘’Kingaway’’. 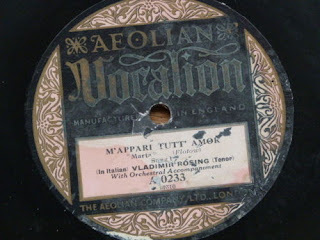 From 1913 to 1921 he gave 104 recitals in London. 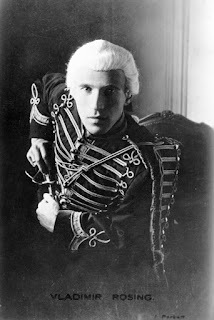 In the 1915-1916 season he appeared with success at the Drury Lane Theatre in London. In 1921, as a member of the Car Rosa Opera Company, he sang the part of Cavaradossi in G. Puccini’s ‘’Tosca’’. The same year he sang at the Opéra-Comique in Paris in the following operas: ‘’The Queen of Spades’’ (Hermann), ‘’Pagliacci’’ (Canio), ‘’Faust’’ (Faust) and ‘’Carmen’’ (Don Jose). The made guest appearances In Brussels (Théâtre de la Monnaie) and Madrid (Teatro Reale). Since 1921 he lived in USA, where made appearances at the opera houses of Chicago and New York. He sang on stage up to 1930. He had a powerful metallic baritonal voice. His most considerable achievement was his concerts activity. In 1916 together with V. Safonov, he organized in Liverpool concerts of Russian music. He was very popular in the US and Great Britain, where his talent was very much appreciated. B. Shaw. He was also a producer, and in 1936 he organized at London together with A. Coates a company of British operas, in 1939 he was the director in Los Angeles of the Californian opera association.